The Board of RTE has said it fully accepts the findings of the BAI and that it is bringing in new guidelines on social media to ensure ‘Tweetgate’ doesn’t happen again. 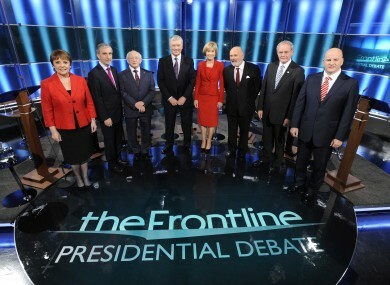 THE BOARD OF RTE has said that the broadcaster failed in its obligation of fairness to Sean Gallagher over the tweet read out during the presidential candidates debate on RTE’s The Frontline programme last October. The Board said that it fully accepts the BAI’s decision to uphold a complaint from Gallagher over the tweet, which was attributed to Martin McGuinness’s campaign and referred to a donation made to Fianna Fáil collected by Gallagher on the party’s behalf. The Board also said that it “echoes the apology” made to Gallagher by the Director General of RTE. The BAI has found that the programmes were unfair to Mr Gallagher in three respects: in the broadcast of the first tweet without verification; in the failure to provide clarification on the provenance of the tweet within the same programme; and the failure likewise to provide clarification of this on the next day’s Radio One broadcast of Today with Pat Kenny. In each of these instances RTE failed in its obligation of fairness to Mr Gallagher. The Board wishes to echo the apology expressed to Mr Gallagher this week by the Director General. The Board said that it was reassured by a number of findings by the BAI. It also acknowledged the public concern caused by the matter. The Director General of RTE has confirmed new protocols are in train to ensure that RTE’s internal rules and regulations meet the standards of journalism and current affairs coverage. An internal editorial standards board is to be established to maintain and monitor appropriate standards, the Board said. A new full set of Programme Makers’ Guidelines is being finalised, which will include protocols governing the use of social media in RTE’s journalism, particularly in live programmes. There will also be an “intensive” review process with senior editorial staff to address issues and concerns, as well as potential risks, highlighted by the furore over how the tweet was dealt with. Email “RTE failed in obligation of fairness to Sean Gallagher... says RTE Board”. Feedback on “RTE failed in obligation of fairness to Sean Gallagher... says RTE Board”.